Summer time is definitely the time to enjoy more salads with our meals. I for one would rather have salad with my meal on a hot day than hot vegetables. I do love homegrown salad vegetables but some times it is certainly much easier to open a bag of ready prepared salad. Florette is a perfect example of a great, ready prepared summer salads. It is great to go in sandwiches, as a side dish or as a simple salad leaf meal. Even though we all associate salads with summer, they can be enjoyed throughout the year. After having a summer of over indulgence I am going to kick start my health by having September as a month to start re thinking about me and my body. This is going to mainly be eating healthier but also exercising again and getting some more time back for me. I am going to incorporate salads into our meals more and have them throughout the year. A Salad For All Seasons is a great book that I will be using a lot. It shows how salads can be enjoyed whatever the season! If like me you are wanting to detox your body a bit after the summer Florette have created a great 5 day healthy eating plan which is full of delicious recipes. I will definitely be trying the smoothie recipes and the vegetable pesto flat bread pizza looks so good! Pop over and take a look for lots of salad inspiration! 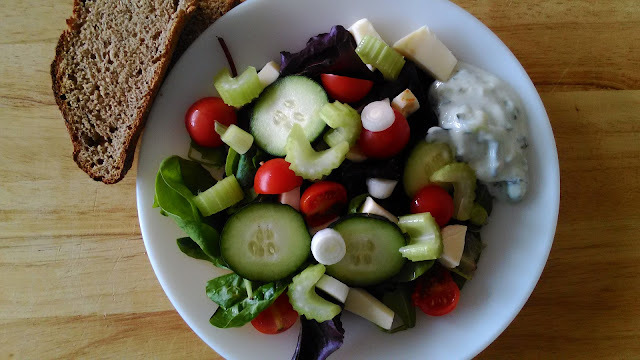 I enjoyed my Florette leaves with traditional salad vegetables of cucumber, tomatoes, celery and spring onion. I topped it with pieces of Port Salut cheese, a side serving of my homemade tzatziki and a couple of slices of nutty smoked soda bread. Delicious! 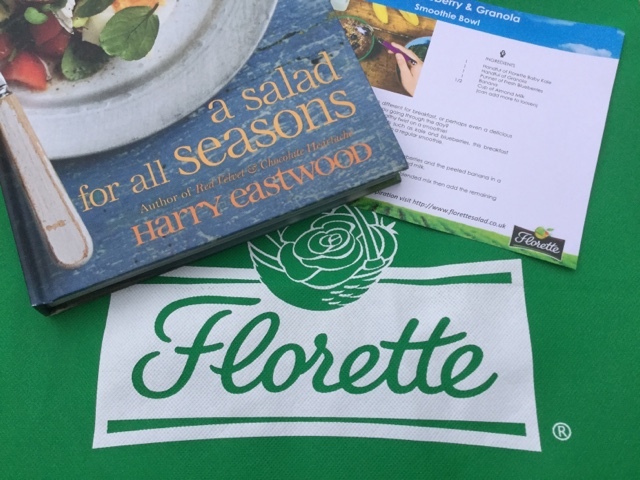 Disclosure: I was sent a Florette goodie bag and the book for the purpose of this post. No cash payment was received. All views, opinions and words are my own and 100% honest.